This is a simple program to implement a LED dimmer: a PWM signal is used to light the leds at varying brightness according to a 4-bit linear scale made of sixteen steps. PWM, or Pulse Width Modulation, is a great method of controlling analog circuits by using the digital output of a microprocessor. The PWM signal consists of a modulated square wave. The modulation can change the clock cycle of the signal (frequency) or the percentage of the power delivered during each clock cycle (duty cycle). The amplitude of the signal remains stable during the time. If we drive a LED with a PWM digital signal, we can effectively control the light output (brightness) by varying the duty cycle: for example if we use a 33% of duty cycle over a short duration of time, we will turn the LED ON for the 33% of the cycle and OFF for the remaining 67% of that time period, so the LED will appear less bright because it does receive a third of the power. Since humans perceive brightness not in a linear way but logarithmically like hearing response, we need to implement a PWM signal in which the duty cycle varies according to a logarithmic curve. Because implementing transcendental functions via algorithm is cumbersome and the values we need to cover are only sixteen, the most efficient way is to create a sort of look-up table for all the sixteen possible duty cycle values. A duty cycle with 8-bit resolution, with a range from 0 to 255, looks enough for our purpose. 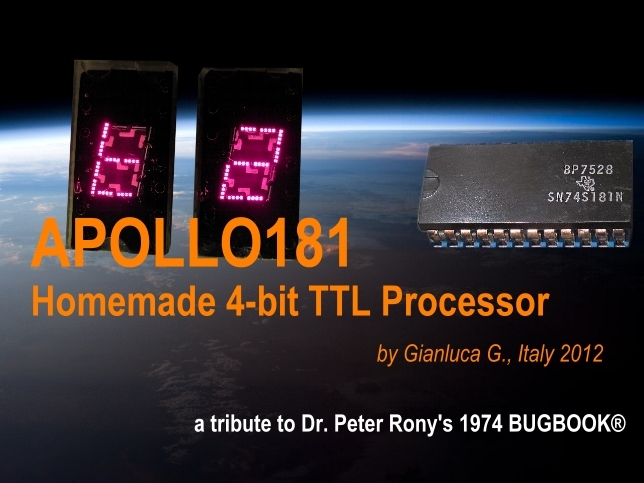 To much simplify the algorithm I preferred to program the eight switches of APOLLO181 using the Johnson Counter sequence (i.e. 0000; 0001; 0011; 0111; 1111; 1110; 1100; 1000 ...), in which only one switch changes status for each brightness magnitude step. This is a convenient way to fast switch between 16 distinct states for controlling the duty cycle of the PWM signal. The important factor here is the refresh rate: if we use a frequency that is too much low, we will turn the light on and off too slowly and the viewer will see the LED ‘flickering’ and not a stable light. So we need a clock cycle beyond the limit of the flicker perception of human eye, and anything faster than 100 Hz would be probably OK. Thus we will adopt in this program an approximate cycle of 180 Hz, that has a period time of 5555 microseconds. Being 3 MHz the clock of APOLLO181 and because every instruction takes four clock cycles, each instruction takes 1/3 * 4 = 1,333333 µs to be executed. We will need then to create a precise routine of delay which shall last in total 5555 µs, that approximately equals to 5555/1,333333 = 4166, about 4096 instructions that consist of 256 cycles of 16 instructions each. DISCLAIMER & CREDIT: All data here reproduced are for educational and non-commercial purpose, following fair-use guidelines. This is an INDIPENDENT AND UNOFFICIAL hobby site. Either Dr. Peter R. Rony or the Blacksburg group or Computer History Museum (Mountain View, CA) or other third-party DO NOT HAVE ANY ASSOTIATION with this work. Author G.G. DOESN'T EARN ANYTHING FROM ADVERTISEMENT. This site is not in the business of making money. This site is visible thanks to the Free Web Hosting Tripod Service, so it is ad-supported: advertisement contents, costs and revenues are full managed by the service itself. Author does not have any involvement in them. The advertising links in the Site pages and in the pop-up windows are not Author's property. They can change and the Author is non-responsible about their contents and working. The Author is not responsible about the linked sites. The information presented here is just that: INFORMATION. Use it at your own risk and for only non commercial purpose. The information here presented is believed to be technically correct and everything presented on this site is done so in good faith. Anyhow you (the reader) are responsible for anything that you might do as a result of reading this article. You assume complete and total responsibility for your actions! Author is not responsible for any misuse or damage coming from the reading and using this information. Text and images from original typewritten Bugbooks I and II in 1974 are permission courtesy of Dr. Peter R. Rony, the original author and sole copyright owner of the Bugbooks I, II, IIA, III, V, and VI. The background image on the header of each page of the site is "Sunset over western South America" photographed on 12 April 2011 by an Expedition 27 crew member on the International Space Station. (Image credit: NASA). On it I have merged titles and a my photo of TIL302 displays. Texas Instruments data are Texas Instruments Copyright and reported by Courtesy of Texas Instruments. TERM OF USE: With clear exception for texts and images which are not author's property, Gianluca G. freely authorizes you the downloading, printing and reproducing of APOLLO181 data, texts and images ONLY for non-commercial usage and ONLY if you give a clear reference to its source and project name, without any right to resell or redistribute them or to compile or create derivative works.